Taste receptors on the tongue transduce the chemical information of food into neuronal signals. As of now, people have identified a wide variety of receptors for sweet, sour, salty, bitter, umami, fat, carbonation, and water. Three of the taste qualities - bitter, sweet, and umami - are transduced by G-protein coupled receptors. This is the story of how the sweet and umami receptors were discovered. In the 70s, multiple labs reported that different strains of mice had different sensitivity to sugar, and dubbed the more sensitive mice "Sac" tasters. They eventually traced the responsible genes down to the distal end of chromosome four, which they dubbed the "Sac" locus. Circa 2000, the Zuker and Buck labs sifted through the genome, and reported the discovery of a set of putative taste receptors. 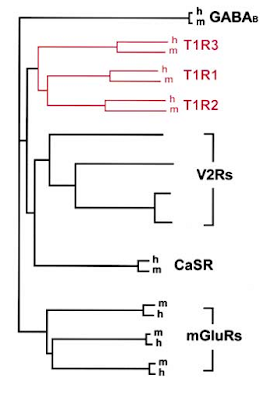 Gene clustering and immunostaining showed that these receptors could be broadly divided into two groups: T1Rs and T2Rs (Taste # Receptors). One of the T1Rs, T1R3, was traced to the Sac locus. Nelson et al (2001) tested whether T1R3 was indeed the Sac gene by knocking-in the whole Sac locus into "non-taster" mice. They then tasted the mice's sweet sensitivity, and found that the Sac/non-taster mutant mice had a lower threshold for sweet tastes, turning them into taster mice. 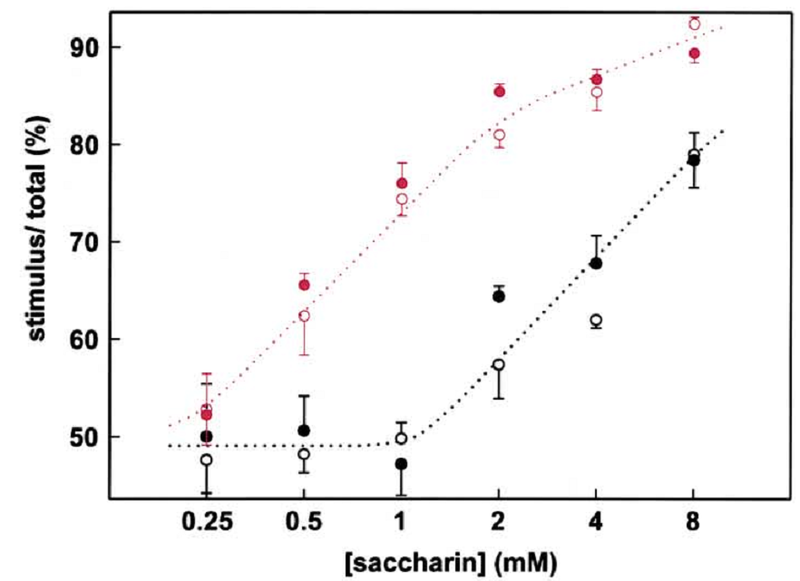 Sac taster mice have a low threshold for saccharin (open red circles). Non-taster mice have a high threshold (filled black circles). 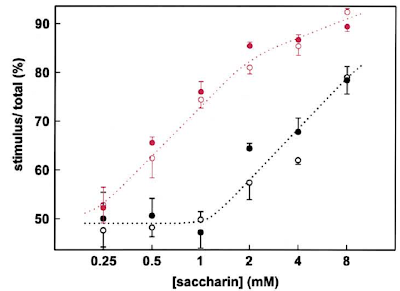 Non-taster mice with knocked in Sac locus have a low threshold (filled red circles). From Nelson et al 2001. They then performed in situ hybridization, and found that T1R3 was expressed all over the tongue, while T1R1 was expressed at the front of the tongue, and T1R2 was expressed at the back of the tongue. Notably, T1R1 and T1R2 were never expressed alone, but always in combination with T1R3. They next tried to find what these receptors recepted. To do this, they expressed the receptors in HEK cells. Mouse T1Rs did not express well in the human HEK cells, so they used rat T1Rs instead. Since they did not know the G-proteins these receptors were coupled with, they used the promiscuous G-proteins Gα15 and Gα16. 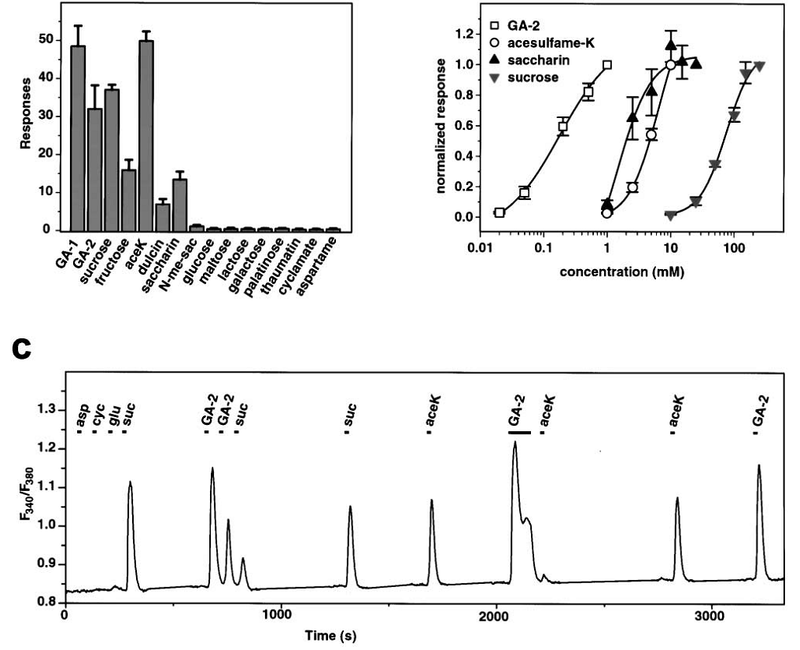 Then to read out the activity, they detected calcium with Fura-2. They tested each receptor individually, but could not detect responses in cells with individual receptors. Then they moved on to combinations of receptors, starting with T1R2+3, which responded to a variety of sweet tastants like sucrose (top left, below). For controls, they left out the G-proteins, and saw no response. T1R2+3 responds to sweet tastants. (Top right) Dose-response curve for sweet tastants. (Bottom) Timecourse of [Ca] following tastants application. Mice have different sensitivities to sweet compounds, and Nelson reasoned that this could be due to the receptors themselves. They graphed the receptors dose-response curve, and found that the receptors' EC50s generally agreed with the behaviour (top right, above). For example, sucrose has an in vivo threshold of 20mM, and in the HEK cells it was ~50mM. They also sloppily characterized the kinetics of the response, showing it was low latency (<1s), with a slow time off, and that they partially inactivate during prolonged exposure. When they first reported the results in 2001, they could not get heterologous expression of T1R1, but based on its similarity to T1R2 and T1R3, thought it was a sweet receptor. Six months later, though, they reported T1R1's function. While most people are familiar with the tastes of sweet, sour, salty, and bitter, few people can name umami. Umami was discovered around 1900, and is sensitive to amino acids, which taste "delicious." This is most familiar in daily life as MSG. In 2002, Nelson used the same heterologous expression system to look at T1R1+3, and found that they could respond to some L-amino acids (figure below, right panel). For reasons that aren't clear, researchers had found that purines like IMP could sensitize responses to L-amino acids, which was recapitulated here. Notably, IMP alone does not elicit a response. Calcium response of cells expressing T1Rs. b. Cells expressing T1R2+3 respond to "sweet" tasting amino acids, but not other amino acids. c. Cells expressing T1R1+3 respond to L-amino acids, but not sweet amino acids. This response is sensitived by purines like IMP. From Nelson et al 2002. While most amino acids taste like umami, some D-isoform amino acids are perceived as sweet. They tested these D-isoforms on the T1R1+3 expressing cells, and found they did not elicit a response. However, application of D-amino acids to T1R2+3 cells did elicit a response. The percept and the cell biology match. In the final figure of the paper, they performed a set of random little experiments. 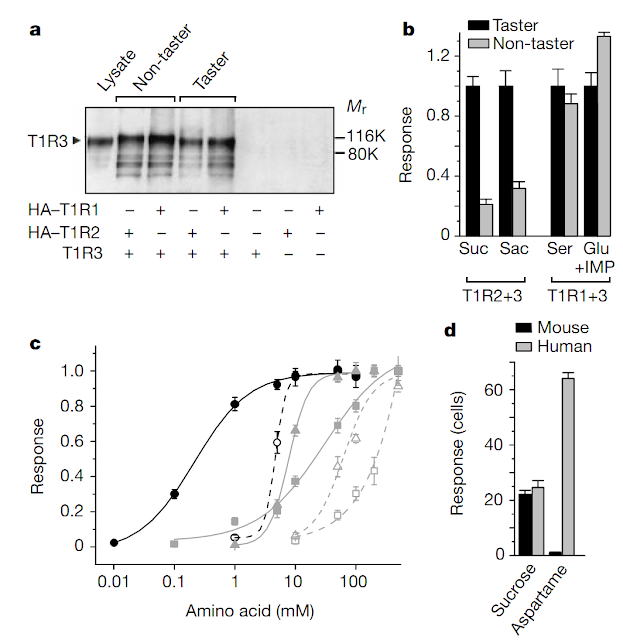 First, they looked at how T1R3 can modulate sweet responses in the taster vs non-taster mice. Their hypothesis was that non-taster T1R3 could not form stable heteromers with T1R2, but could with T1R1. They expressed T1R1+3 and T1R2+3, using both taster and non-taster mutants for T1R3, then immunoprecipitated them using T1R1 or T1R2. They then western blotted for T1R3, and could see it in bands for both taster and non-taster pull-downs (panel a). T1R3 was perfectly capable of former dimers with both T1R1 and T1R2. The also tested non-taster T1R3's effect on umami, and found there was none (panel b). a. Pull-down of T1R1 or T1R2 also bring taster and non-taster T1R3. b. Non-taster T1R3 only effects sucrose response. c. Human T1R1 is highly sensitive to MSG (open circles). This is further sensitized by IMP (closed circles). Other amino acids shown in grey. d. Mouse T1R2 does not respond to aspartame. Having done all the experiments so far on mouse and rat T1Rs, they performed a few on human taste receptors. As mentioned before, MSG strongly elicits an umami response, so they tested human T1R1+3 response to MSG, and found it had a low threshold compared to other amino acids (panel c). It's also known that mice cannot taste aspartame (an artificial sweetener) while humans can. This was shown in HEK cells as well, where human T1R1+3 could detect aspartame, but mouse T1R1+3 could not. These papers present a nice, clean set of experiments which have held up to this day. It's amazing there were only six months between the papers. In the first, they claimed problems with expressing T1R1 in human cells (which I tend to believe, given the called T1R1+3 a sweet receptor), but apparently that was resolved. In the introduction and discussion, they noted that perceptually, there are much fewer sweet tastants than bitter. People speculated that this would imply a smaller number of sweet receptors than bitter. This was found to be true: there is only one sweet receptor, while there are ~20 bitter receptors. Another point of interest is the dissimilarity between human and rodent T1Rs. They plotted the similarity of various G-protein couple receptors in human and mice, and most of them are >90% similar. In contrast, the T1Rs in mice and humans are only >70% similar. These differences have functional implication, like how humans can taste aspartame, but mice cannot. They speculate these differences could reflect different dietary concerns of the animals, while neural circuits need to be reliable. Certainly there is less natural selection against animals with weird taste than animals with malfunctioning synapses. Most G-protein coupled receptors are conserved in humans and mice. T1Rs, however, have some variation.